If you are looking for a computer deer hunting game, you can rest assured they come in no short supply. Some are free, while others cost a pretty penny, but all keep you in the middle of hunting season year round as you sit in front of your computer and become accustomed to using the controls and get your technique down. Lets look at a game or two and see what is available for your enjoyment. The best thing about this version is that it is more than just a deer game. You can switch to different species and practice hunting other animals as well. However, even in hunting deer, you get a safe practice and can take your best shots in fifty different scenarios with any number of weapons available. You can opt free hunt mode, or you can try a challenge. This one definitely isn’t free, but its worth the price! This is not a true deer hunting game, as it focuses on 30 different types of fish and big game, but sponsored by one of the top fishing and hunting gear providers around, you’ll find there are many different editions available on many of the major platforms. It’s a load of fun, geared toward the excitement and action of a hunt as opposed to truly simulated hunting activity. With a free version on Android and the paid version on the games consoles such as xbox and playstation, this game can be a great way to get the adrenaline flowing. 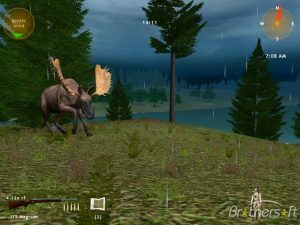 This is a 3D game that allows you to enter a wild area full of deer, moose, and other wild animals. Its an arcade style game and pits you against all types of deer, including a few trophy sized specimens. This game is great because it focuses on deer and is available online through the publishers website for both PC and the Nintendo Wii. To be absolutely honest, this game is fabulous, but much of the excitement comes from that its free. An online Flash game you can play on the ESPN website, you can choose the season, the deer stand you’ll be hunting from, and start on the path to bagging your first deer (virtually, of course). Graphics are a bit basic, but for a free Flash deer hunting game, there should be no complaints! 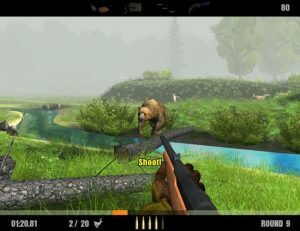 This older deer hunting game is a classic and has had many a rebirth through modile apps on Android and Apple IPhone Of course if you like the classic games, this probably offers the best available.